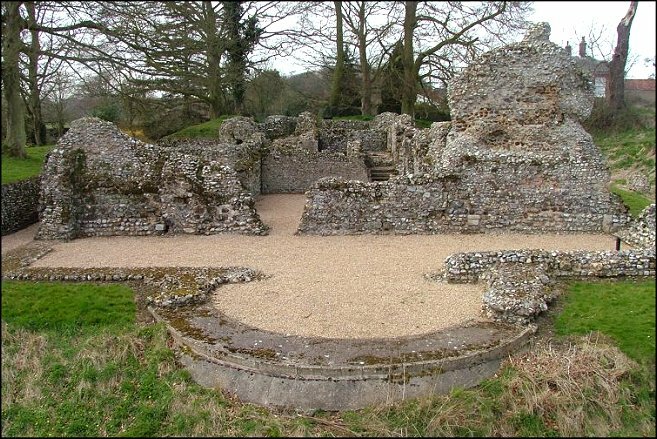 Christianity first reached what we now call East Anglia with Roman soldiers in the 3rd or 4th century - there are remains of what appears to be a church at Colchester - but when the Romans went home the Faith went with them. When the Saxons came and established the Kingdom of East Anglia, they were Pagans; but the Wuffings, the East Anglian royal family, embraced Christianity in the first quarter of the seventh century. This seems to have been partly an attempt to build trade links with the continent. 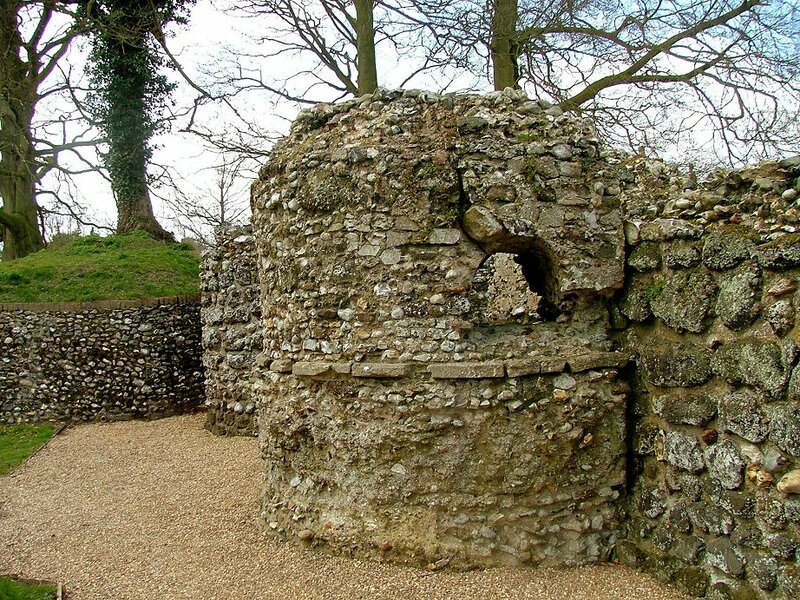 At the time, Ipswich was one of the largest towns in northern Europe, and King Redwald was a wily character who, despite his baptism, eventually received a pagan burial at Sutton Hoo in the hills above the Deben. But Redwald's son Seigbert was more committed, and invited St Felix from Burgundy to evangelise the Kingdom. 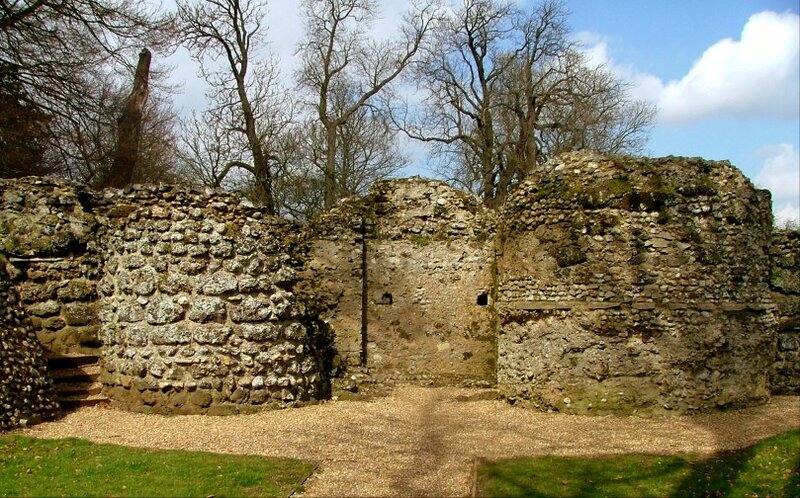 Felix is generally acclaimed as the first Bishop of East Anglia, and he established his see at Dummoc, the modern Walton, not far from the royal palace at Rendlesham and the main population centres in and around Ipswich. Soon, the faith had spread, the East Anglians receiving it enthusiastically. 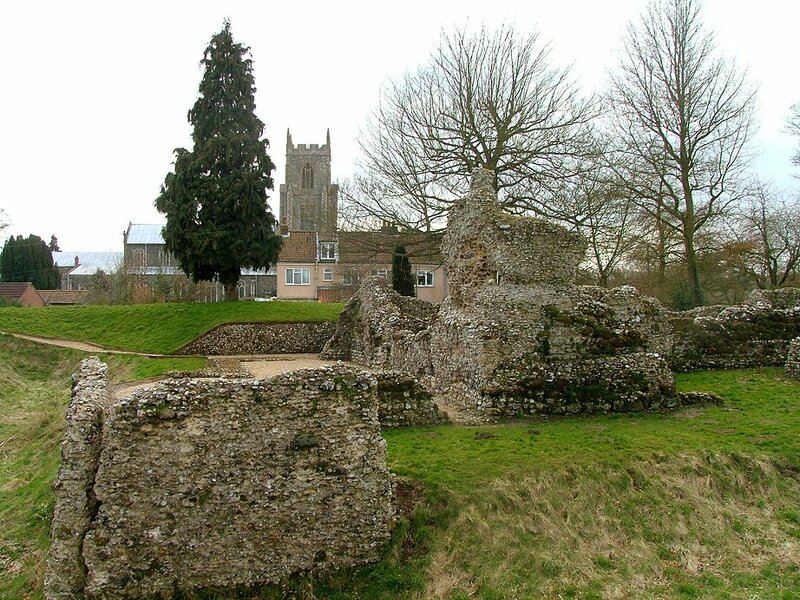 Other missions became involved; that of St Botolph at Iken, and St Fursey at Burgh Castle. And then, the Vikings came, and the Kingdom was reduced to anarchy. The See seems to have lapsed, but by the middle of the 10th century we find the Bishops of East Anglia re-established, with a Cathedral here in the intensely rural valley of the Wensum. Descriptions of their cathedral survive from a couple of centuries later; it seems to have been a wooden building, a stockade as much as a place of worship, and after the Norman invasion it was seen as both inadequate and too remote, by a Church authority that wanted to centralise power. The see moved to Thetford, at the heart of the Breckland, by now East Anglia's most populous area. There was an attempt to move it further, to Bury St Edmunds, by now the principal town of the region, but this was rejected by the monks of Bury Abbey, who did not want to be drawn under English jurisdiction. And so in 1094 it moved to Norwich, by no means a major centre at the time, but close to the great castle and with links to the continent. Today, both Bishops of East Anglia, Catholic and Protestant, still have their Cathedrals in Norwich, which has become the largest city in the region. 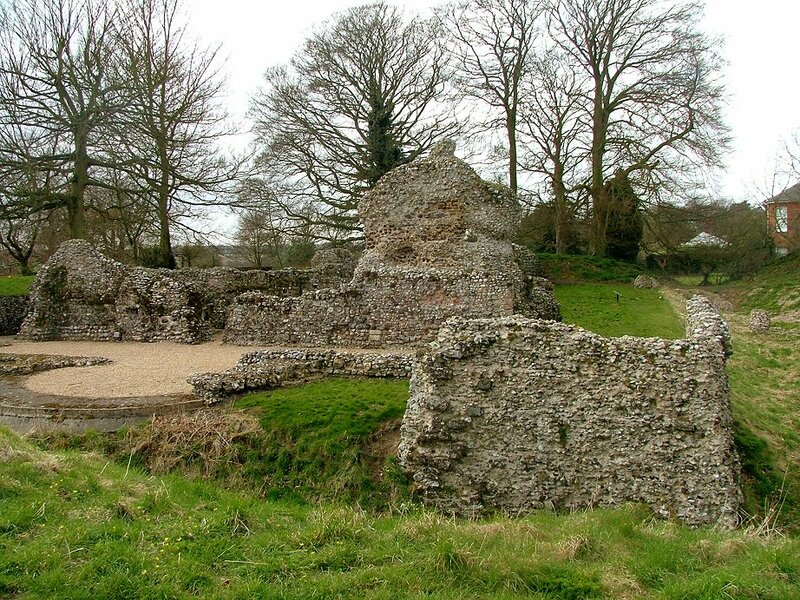 And that might have been the end of the story; but the Bishops retained land in North Elmham, possibly even the site of the original cathedral, and they continued to live here when on retreat from the Cathedral. 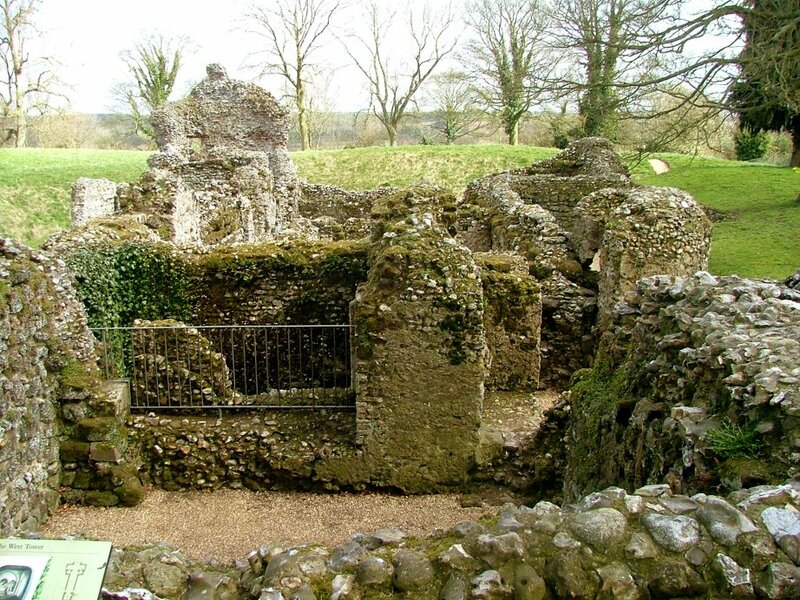 So it was that at the start of the 12th century Herbert de Losinga, Bishop of East Anglia, built a private chapel to go with his house here at North Elmham, and these are the remains that we see today. 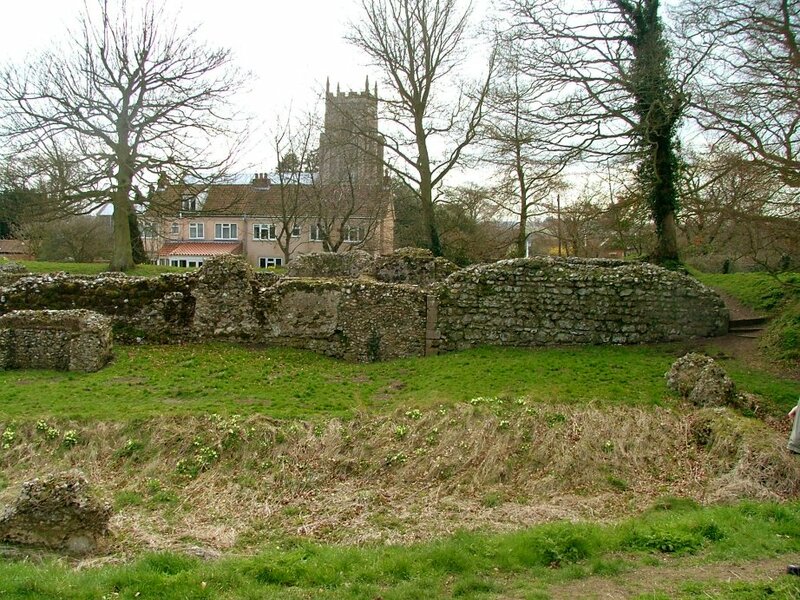 The picture is slightly complicated because there are also remains here of a later building, the late 14th century manor house of Bishop Hugh Despencer, which seems to have incorporated the walls of the earlier chapel. The moat dates from Despencer's time, but there is some evidence that the raised ground to the north west may once have been the site of a small Norman castle. The ruined chapel was about 40 metres long, and the outline of the walls seem to suggest a western tower and an apsed chancel, with two transepts that may also have supported towers. The best views are from beyond the moat, looking down into the ruin, especially from the east. 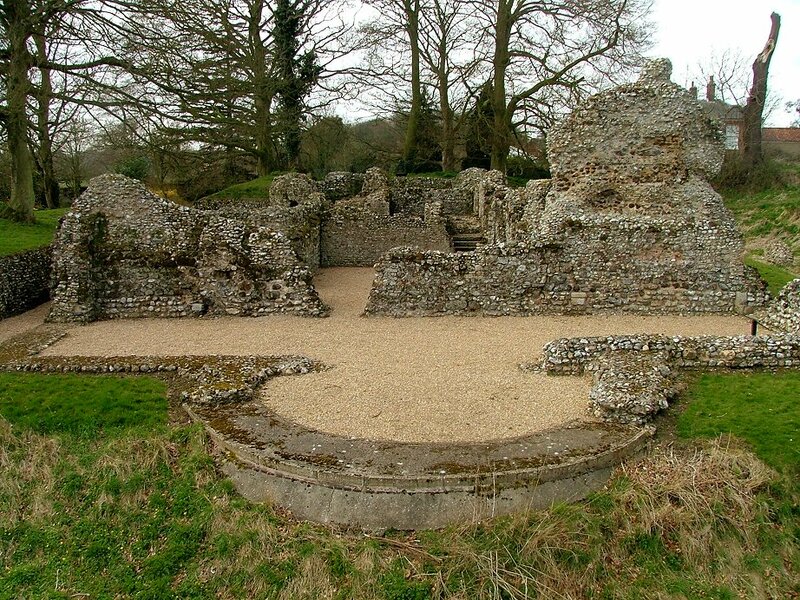 Norman churches are not a rarity in Norfolk, but it is interesting to see the bones of one, as it were, and to extricate the chapel from the later house. Wandering in the ruins themselves can be confusing, because the amalgamation of the two buildings has created some unexpected doorways and dead ends. For a number of years, the ruin was advertised as actually being of the Saxon cathedral; but there are no Saxon remains here, and the signs which suggested that there were have been removed. English Heritage, who don't often get complimented on this website, have also stopped charging an entrance fee, for which they are to be commended. Of itself, this is not a particularly atmospheric ruin, but the setting is super. 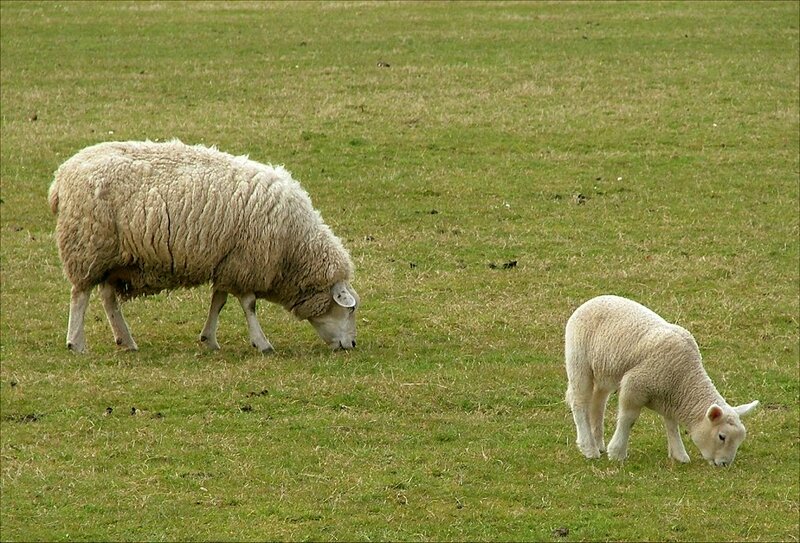 On a sunny day it is a lovely spot, especially in spring, when you can hear the clamour of the new-born lambs in the fields around, and the excited birds in the air above. If the clock strikes in the great tower of the nearby parish church, then you will feel yourself to be somewhere deeply rural, profoundly English, and all the more fortunate for the experience.